The 1958 Chevrolet never enjoyed the iconic status of its tri-five older brothers found in the 55-57 Chevy era. Pick a low end car model back in 1958 and the visual results jumped out like the late stages of leprosy. A stripper base model Ford sedan looked like something you bought with food stamps if you parked it next to a high end 2-door hardtop. Chevys were no different and the Impala was certainly the high water mark in styling if you compared it to the Biscayne or Delray. That was the magic of the era-unlike life in 1958 USSR where the only cars available to the masses (if you could buy one) were state issued, bland clones that ran like Communist crap. In 1958 USA you could pick up a full-load Impala and cause enough stress on your frugal, radio delete, 2 door sedan, Delray–driving neighbor to shame him into a quick house sale.The 3 taillights you had versus his measly 1 or 2 were that trauma-inducing. I have to admit that I never clicked on the ’58 Impala until American Graffiti was released-that’s when I had a cosmic moment…the big white brute that Ronnie Howard drove was a work of art. When he let the nerdish Toad drive the Impala I had the same thoughts as the punks in the show…“what a waste of a beautiful car on a nerd”. 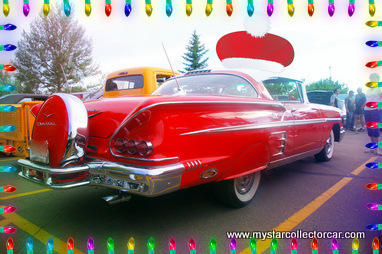 But it wasn’t surprising that even a nerd could pick up a babe with the help of this ‘58 Impala. Years later, I had an opportunity to buy a mint 1958 Impala at a fire sale price-most car guys have a dark moment story like that and like me, they regret the non-purchase for the rest of their natural lives.It’s like turning down Raquel Welch in her prime. A smarter man than me (worse yet, a non-car guy) saw the upside and actually did buy the Impala.He flipped it in half a day for double his money-and he still left 50% of the value on the table. But this isn’t a lecture about smart car purchases-it’s a Christmas car story so… Merry Christmas.